So getting back to the solid data we have in that scan of swatches. You’ll notice that the written notes suggest different color sets were used in different areas of the model. but we will rely more on the Apogee pics for the neutrals. Here are a few model paints I picked up to see if anything happened to match. 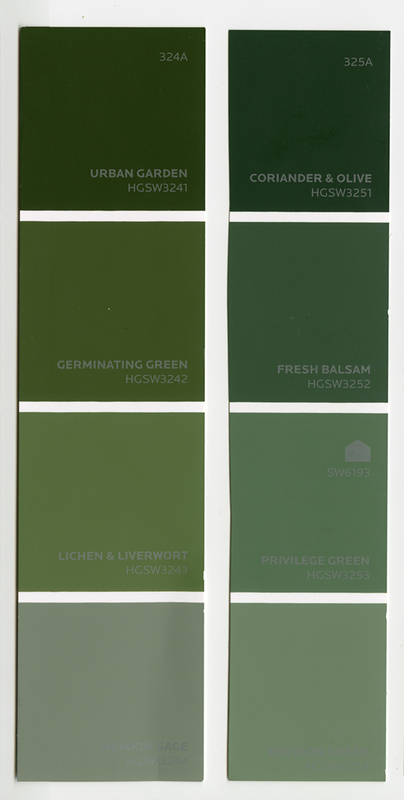 Some of these colors get us in the neighborhood, but may need to be combined or lightened. The Sea Blue goes on the rear end of the nacelles. 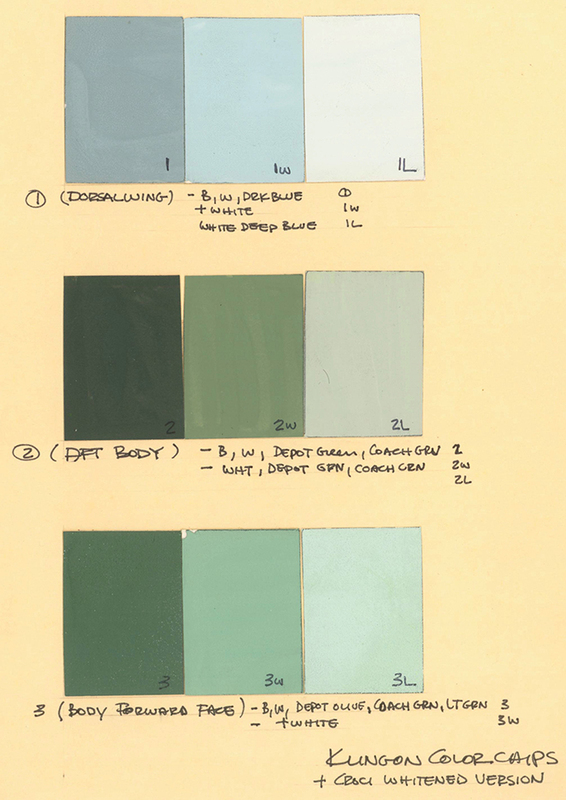 I mentioned that John Goodson had identified a couple colors through the Smithsonian data base. 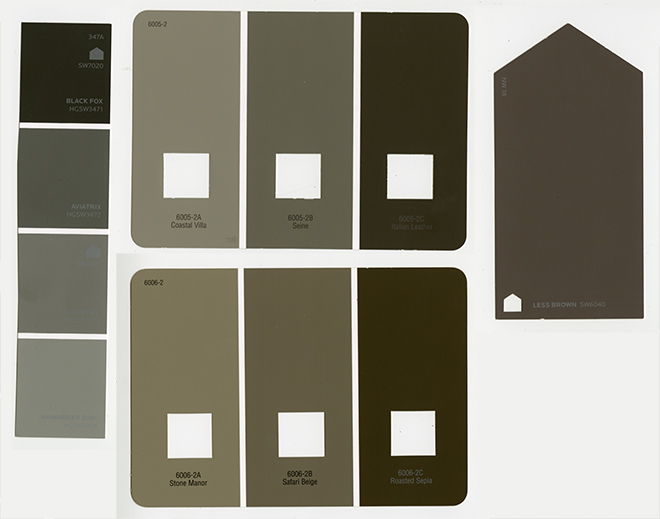 He described the results as such “the base color is Benjamin Moore, Topsoil- CC – 692, the darker accent color is Benjamin Moore Blacktop – 2135 – 10.” So after googling the colors, I was baffled… (I also attained swatches from the store. Ironically, one color was only available in Canada…) Neither looked like anything I was seeing in photos and neither was close to the main greens or neutrals. Based on all gathered reference, both seemed way too dark to have been used on the miniature. we see that the entirety of the back of the ship was a dark neutral. Jim and I decided (yesterday) to settle on a “light black” for this color. The kit will be injected in this color and it is close to the Blacktop color match. Besides being a nice dark surface to start with from a painting standpoint, it might also help with light leaks. It has been determined that this dark neutral was used everywhere I had perceived as the dark blue in the Apogee pics. (reflected light from the clear blue sky…?) 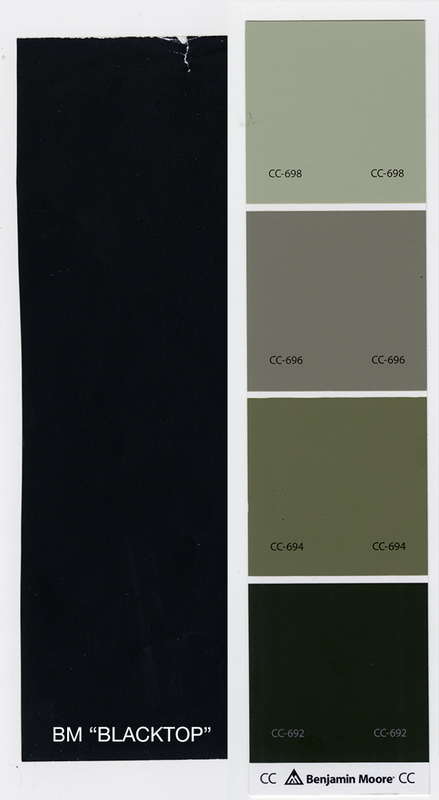 This color is also used for the bands around the windows on the head. The green shades all show plenty of variation as if each shade was blended into the others, and in a few cases we pick up on darker green tones especially on the head and engineering area. 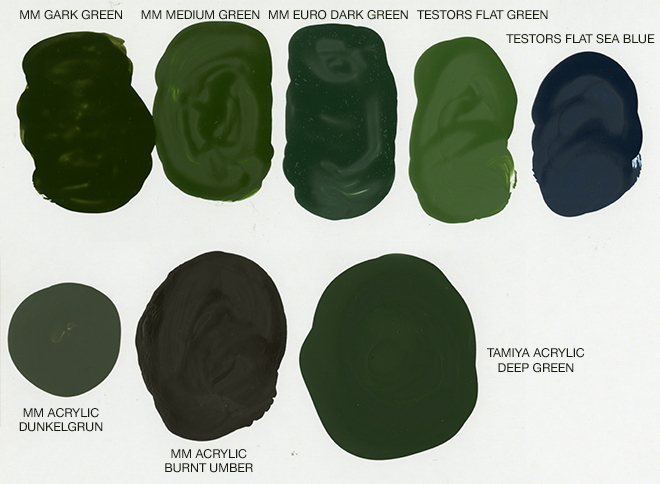 Chromium oxide paint supplies a few distinguishing streaks of green/mustard yellow over everything. This is apparent in both of the photo surveys. There seems to more weathering streaks on the bottom that can be perceived on top. Which leads us to that pesky neutral tone. We have to ignore the tan mess that we see in the Bill George pics, but can we rely on it for color temperature? (the “tan” is new, but how close was that to the underlying color?) We have to weigh the look of the color in some pics against how it looks in others. 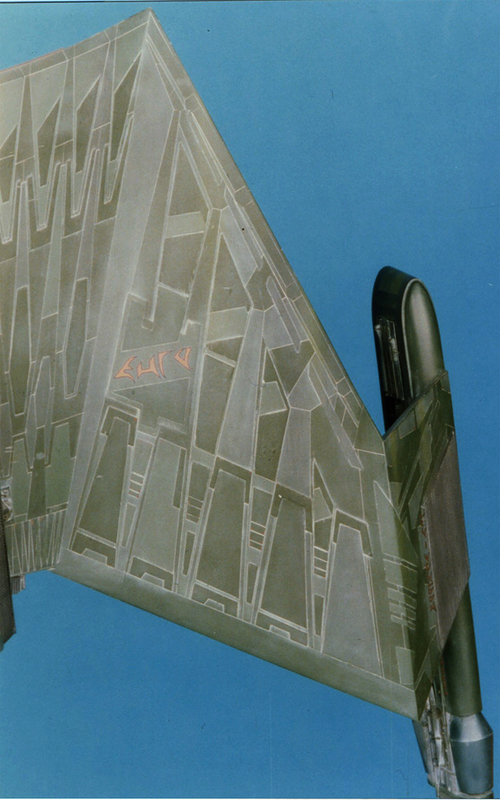 The early Apogee photos look close to that early pic of Andy Probert painting the weathering. It looks more like a gray, but possibly a warm gray. If someone wants to make some suggestions… If you have an extensive Floquil paint collection and you think you can decipher which colors were used, speak up fast. Maybe we can take your suggestion into account for the kit. So… yeah…whew… that’s it. Or at least everything I can articulate in any kind of organized way. I’m sure your mileage may vary. Do with this info as you will. At least use it as a reasoning for what we will specify in the kit. This entry was posted on Monday, August 6th, 2018 at 11:52 am	and is filed under Round2 Models. You can follow any responses to this entry through the RSS 2.0 feed. You can skip to the end and leave a response. Pinging is currently not allowed. 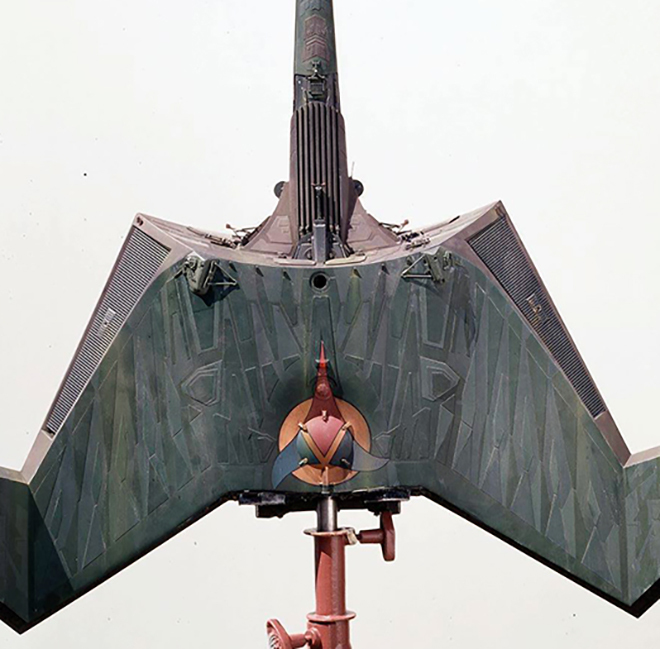 Excellent research Jaime on the studio miniature paint scheme. 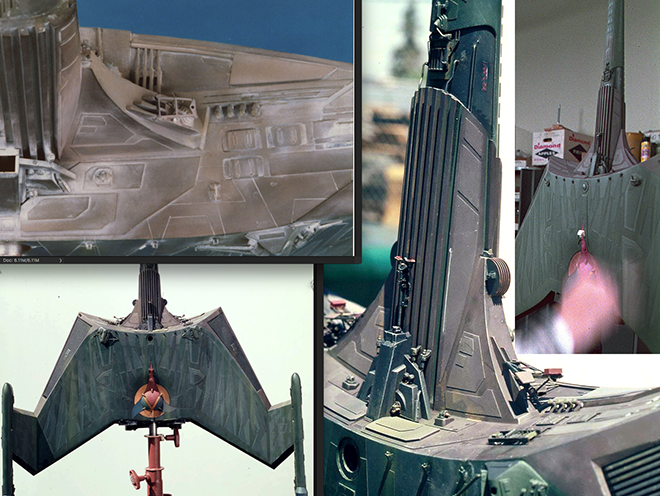 It’s important to note that large scale studio models are painted quite differently than smaller model kits. 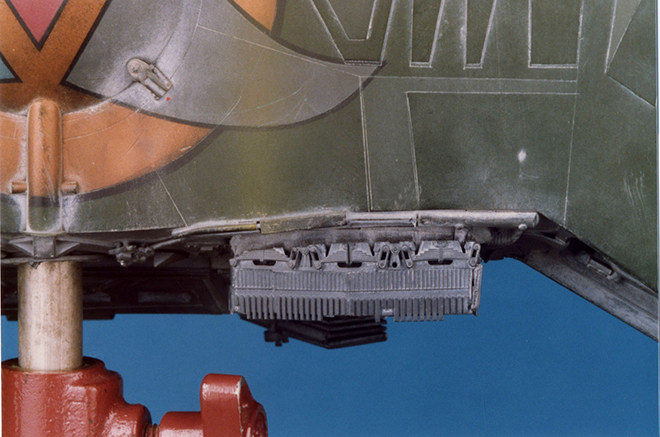 There is apparently alot of “layering” and “misting” on studio model paint. Alot. 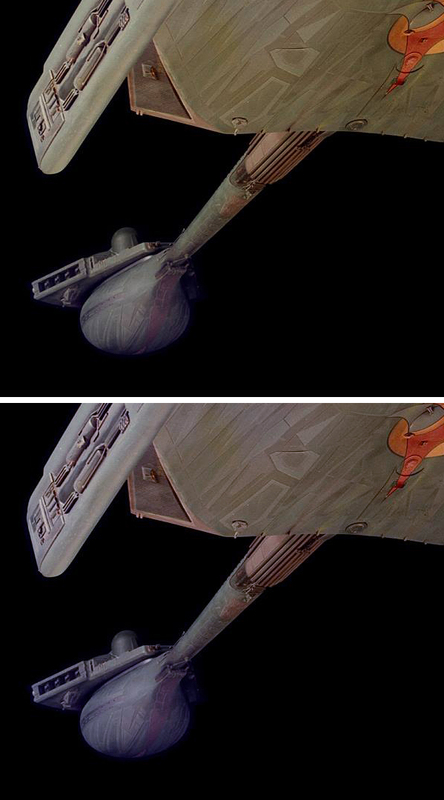 My observations of the rear and forward secondary hull strong-backs: is that the base color is a medium neutral grey, followed by various shadings of lighter and darker grey panels, then for “weathering” lightly misted blacks, and beige/rust color giving that brownish / mauve hue in some photos. Then finally the white wash over the surface. The best Klingon K’tinga green colour I found was Floquil Military Color’s Medium Green 303033 . Nasty stuff made with Xylol and petroleum distillates . 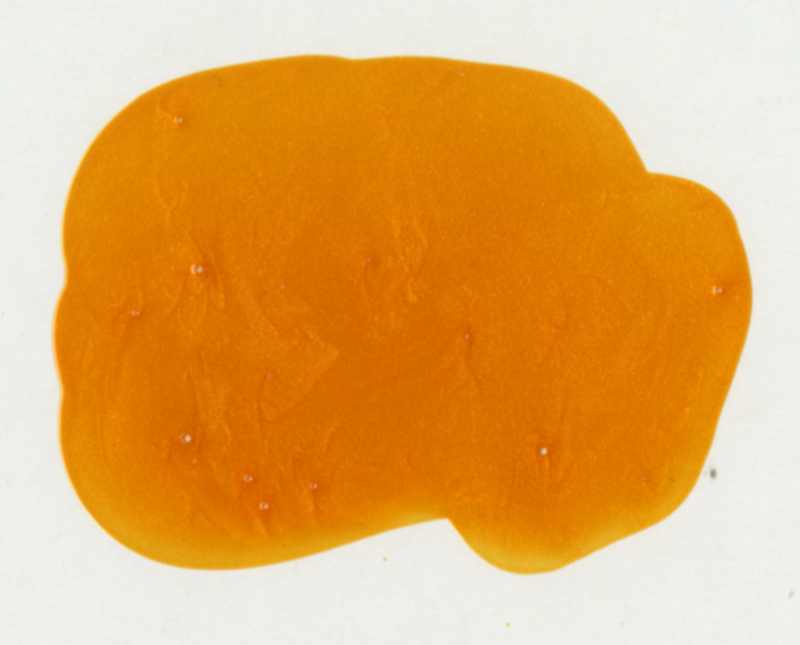 Floquil never replaced this exact colour with a friendlier acrylic paint AFAIK . Fantastic research going into this and great idea about the black plastic to minimize light leaks. 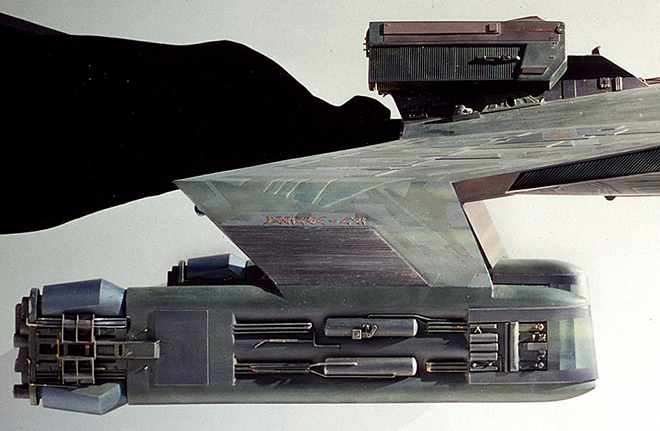 The work and time you invest into this is amazing special for a ship were it is very hard to find anything useable. Okay – With all of the information contained in the recent posts, my head is swimming. Great work! I can’t wait to see the kit when it hits the store shelves! Not to rain on your parade, but I’m sure you’re aware by now that Testors has discontinued most of the Military Model colors.